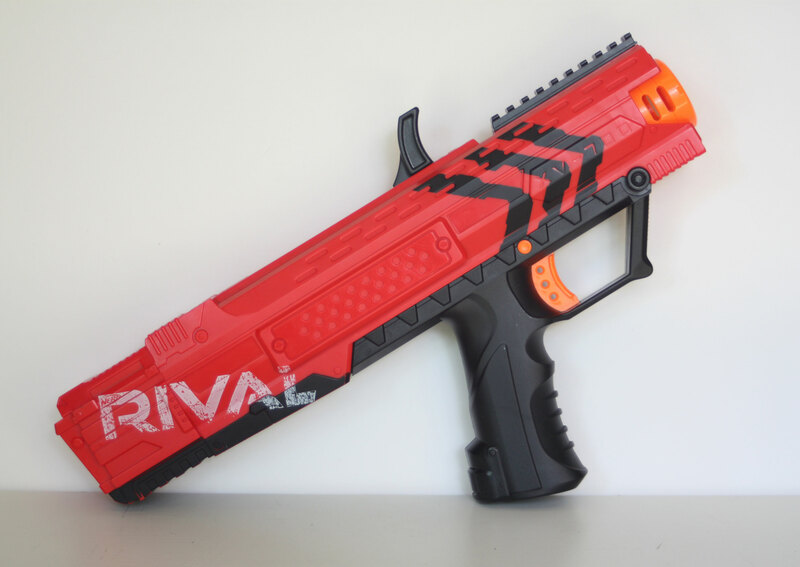 Last year’s announcement of the Nerf Rival line had many fans excited in the Nerf blaster community due to the claimed performance of the new blasters. 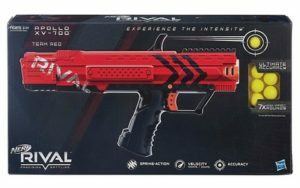 Currently, there are two Rival blasters in stores: the Rival Apollo and the Rival Zeus. Very soon we’ll be seeing the fully automatic Khaos and the multi-shot Altas. 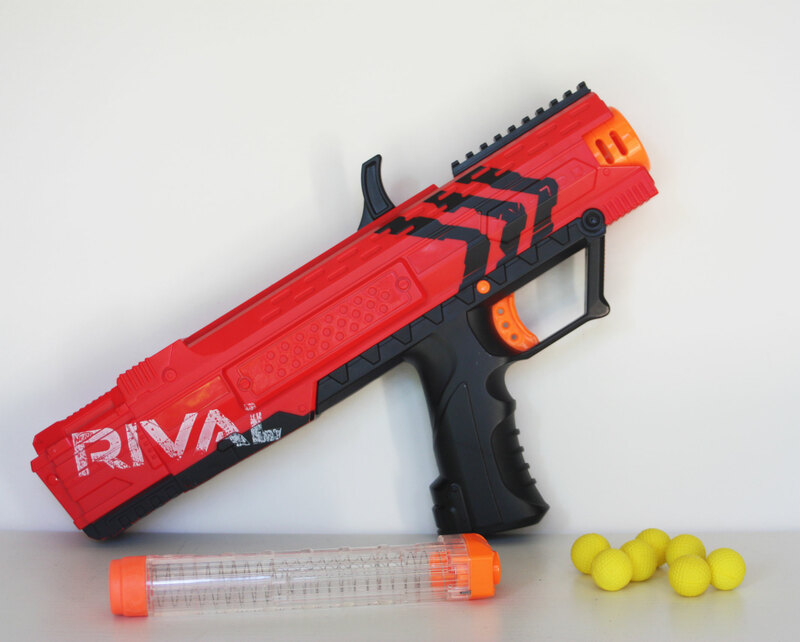 But today, in this Nerf Rival Apollo XV-700 review, we’ll see if it lives up to Hasbro’s claims! 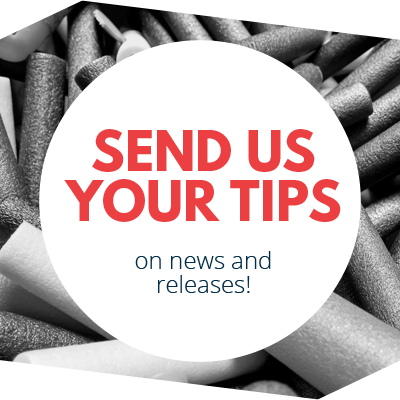 Included with the Apollo are seven High Impact Rounds (HIRs–which are foam balls), a seven round magazine, and an instruction sheet. Note: there is also a blue version of the Apollo available. The new ammunition type is relatively firm, yet it won’t hurt your opponent. Just like golf balls, these impact rounds have little dimples to reduce drag. 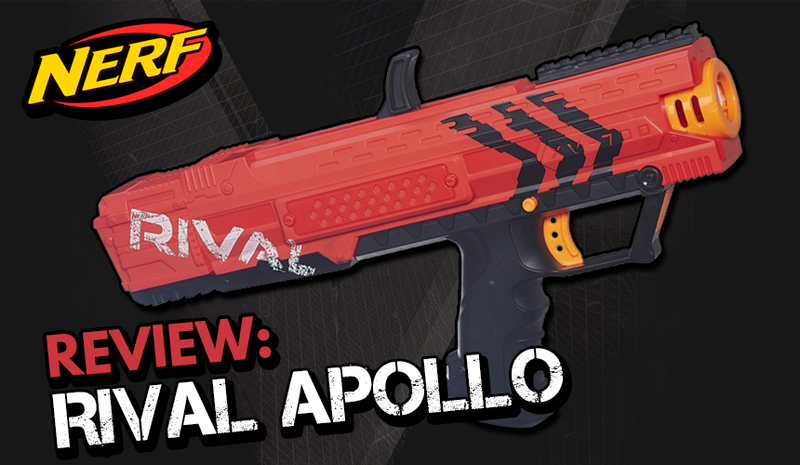 If you haven’t noticed already, the Apollo looks completely different from your usual Nerf blaster. The blaster’s aesthetic has a more serious tone and does not appear to be very kid-friendly. In fact, the Apollo isn’t meant to be kid-friendly, as the box claims the blaster is meant for ages 14 and up. As if to drive home the point, there is also a safety switch located above the trigger. Holding the Apollo is fairly comfortable, but for someone who has small hands, that person may find the handle too big. 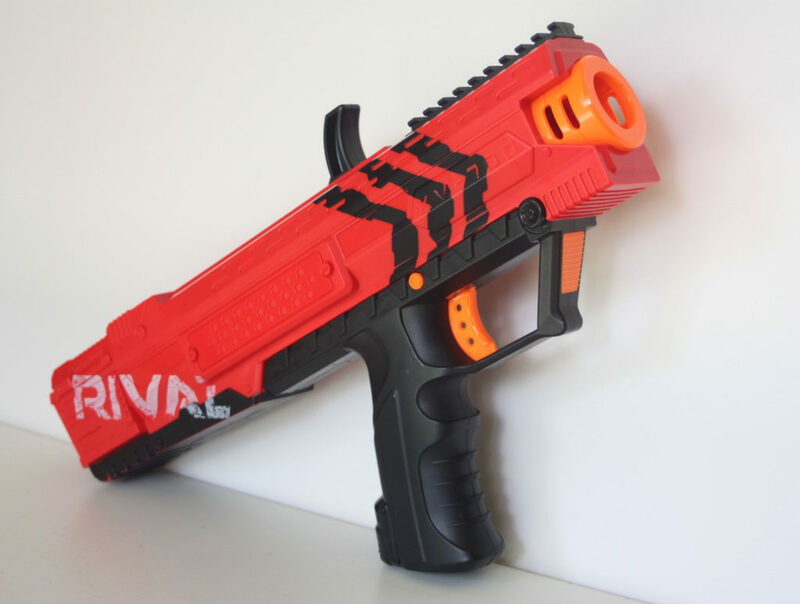 It also features a tactical rail but not the type you’d see on a N-Strike blaster. It very much resembles rails featured on real guns. It is still possible to fit N-Strike attachments onto the rail, but it’s not ideal. 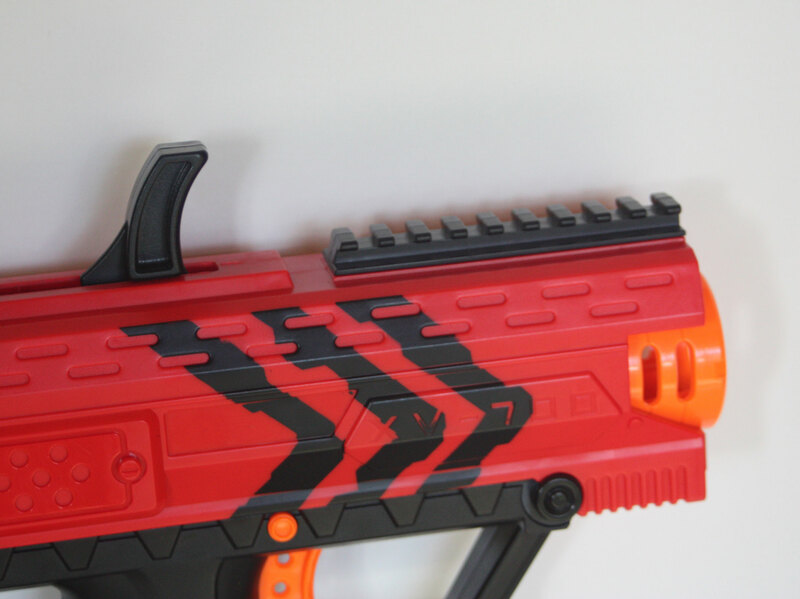 To operate the Apollo, load up your magazine with seven High Impact Rounds (those foam balls), then push the magazine up into the bottom of the handle (one of my favourite features of this blaster). Pull the black priming handle all the way back, then push it forward. Then the Apollo is ready to fire. Repeat priming the blaster to fire the rest of the ammunition. Priming the Apollo is quite a challenge, as it is a long and clunky prime, but the main problem is in keeping the Apollo stabilised when priming. Whenever you pull the priming handle, the back of the blaster automatically tilts downwards. The image below shows this issue. Obviously if one is endowed with better-than-average muscle strength, they’ll be able to prime the blaster in a steady manner. But if you lack arm strength, I suggest resting the back of the blaster on your arm, that way the Apollo won’t be prone to tilting. Unfortunately, resting the blaster on your shoulder feels awkward, due to it’s small and short stock. There is also a jam switch on newer models (the original version lacked this), but it’s rarely utilised. The only type of jamming issue you’ll typically experience is when two balls are fired at the same time due to double priming. Doubling priming happens when the priming handle isn’t pulled all the way back. If it has not been primed properly, you will need to push the priming handle back to its original position, then prime it again. This creates two balls lodged in the priming mechanism. The performance of this blaster did not disappoint. The Apollo can easily reach ranges of over 25 metres, and is capable of firing at a velocity of 100 feet per second. Since it has such a high velocity, you are able to quickly hit your opponent in a close combat situation. Out of all the Nerf blasters I have tested, I can confirm, the Apollo’s range surpasses all of them! 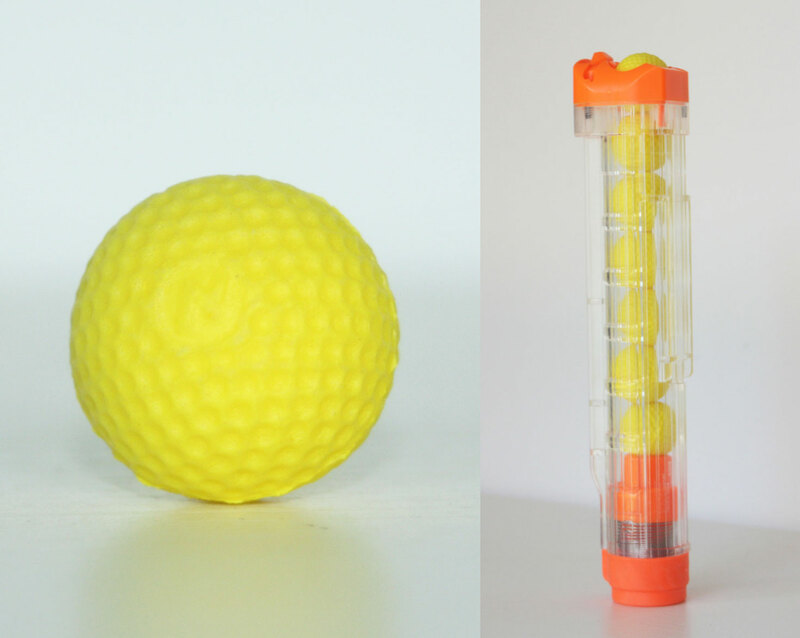 As far as Nerf blasters go, the accuracy is quite impressive. In my tests, most shots flew in a relatively straight line. My verdict? The Apollo is a powerhouse when it comes to performance. Shooting up to 100 FPS and achieving ranges above 30 metres, this is an exceptional blaster to use, especially in close combat situations. It may be an awkward blaster to prime, but if you can overcome this problem, I definitely recommend buying the Apollo. This blaster might not have the best capacity nor the fastest rate of fire, but I believe it is worth purchasing just for its incredible power. 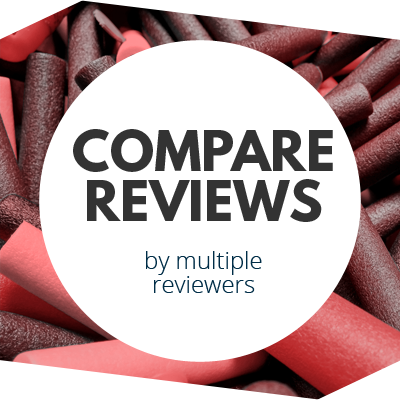 This entry was posted in Reviews and tagged apollo, blaster, blaster hub, nerf, review, rival on July 1, 2016 by JJ Reviews. 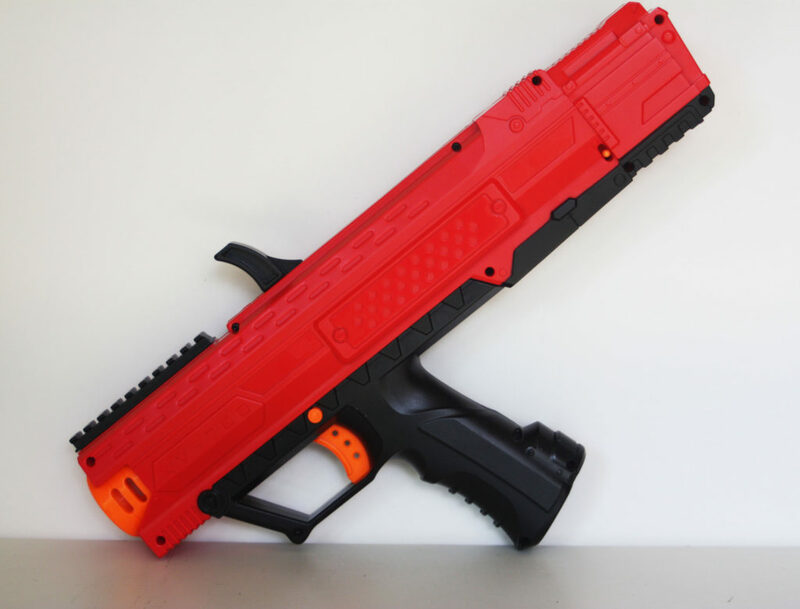 No mention at all of how you can muzzleload a mega dart or load in an HIR and then put some Nerf or BoomCo darts on top of it? That’s one of my favorite features of the Apollo. can u remove the mag anytime?